Confused About Paper Weight? Get the 411 Here. When it comes to specialty paper & paper weight, our customers are generally concerned with paper thickness, how it feels in their hands, and whether or not they will be able to print the paper at home. So naturally, there is concern when a thick card stock and a thinner, lighter sheet are both listed at 80lbs. How can it be? Paper weight can be a little bit confusing. To answer this common question and clear things up, we’re going to explain the standards used to attribute paper weight (also referred to as paper density, the mass of the product per unit of area) in this easy to follow video and article below. How can a heavier card stock and a lighter paper both weigh 80lbs? When it comes to paper weight, our customers are generally concerned with paper thickness, how it feels in their hands, and whether or not they will be able to print the paper at home. 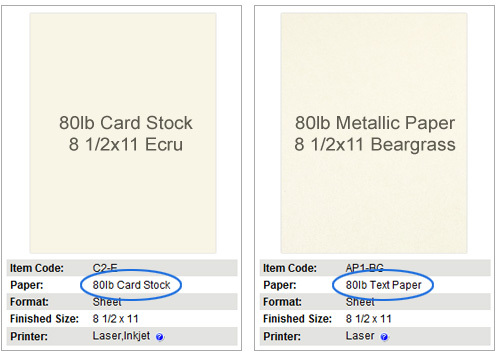 So naturally, there is concern when a thick card stock and a thinner, lighter sheet are both listed at 80lbs. How can it be? To answer this common question, we’re going to explain the standards used to attribute paper weight (also referred to as paper density–the mass of the product per unit of area). What is the scale used to determine paper weight? Unfortunately, there isn’t just one scale; there are two systems used to measure paper weight. Which system you use depends on your country. If you’re the type of person that likes to understand how things work, you’ll want to learn about both. (1) My country uses the metric system. The simplest and most widely used convention outside of the US is grams per square meter (g/m² or GSM)–the weight in grams of a 1 meter x 1 meter sheet. If a 1 x 1 meter sheet of a particular line of paper weighs 120 grams, then that paper weight is 120 g/m². All grades and paper types use this simple scale. With the metric paper density system, you’ll never run into a case where a heavier paper has the same or lower g/m² number as a lighter paper. The higher the number, the heavier the paper. If the number is lower, the paper is lighter. (2) I’m in North America. How can a text weight sheet and a card stock both carry the same weight? Now we can finally answer the original question (which is only a scenario that would surface if the weights were calculated using the US paper density system). Since one paper is a text weight grade and the other is a cover stock grade, they use different size base reams when they are weighed. You should almost think of the two paper grades–text and cover–as being weighed on different scales. Like the product shown at the top of this article, there are often scenarios where a heavier, thicker card stock is rated the same weight as a lighter text weight sheet. We know that an 80lb cardstock is heavier than 80lb text paper because the cover stock uses smaller base ream dimensions than the text paper, yet still holds the same weight. 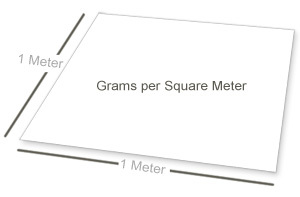 Now that you’re familiar with the US density system of different base ream sizes for different paper types vs. the single scale metric system of grams per square inch, you can use our Grams to Pounds Calculator with confidence. Use it to quickly convert from one system to the other. 140lb Card Stock is the heaviest paper on your list. I am considering buying a printer which says it can handle up to 220gsm. Do you know whether this is referring to text or card stock? Secondly, what would 130lb card stock translate to in gsm? Would it be less than 220gsm? GSM stands for Grams per Square Meter, the metric standard for measuring paper density. The manufacturer of the printer you’re interested in uses the European system of paper density, not the North American system, for their paper weight specs. If you use our handy Paper Stock Weight Calculator (above), you will see that 220 gsm equals 81 lb cover. You did not mention if you are planning on purchasing a laser printer or inkjet printer, however our 80lb / 220gsm Linen Card Stock Paper should work fine using either one. To answer your second question, again, you can use our Paper Stock Weight Calculator to calculate card stock to gsm. 130 lb card stock is 352 gsm, quite a bit heavier than the manufacturer’s recommendation. I am looking for 2 different card stocks with similar appearance and thickness but with dramatically different densities. Is it possible for example to find a 10pt. card stock weighing in at around 275gsm and another that is about the same thickness weighing only half as much? Coatings and finishes used in the manufacturing processes of paper will change the density of the paper. For example single side coated vs double side coated paper although the same grams will have different densities. A great example is our So Silk Brand of paper. This card stock is a 130lb card stock however the unique manufacturing processes used to create its soft and subtle finish will make this a less dense sheet than many lighter weight card stocks on the market. For Christmas, bought the wife a HP Officejet 7500A printer. This is a wide format printer with the capability of printing on 12 x 12 paper. She would like to get her hands on just a ream of regular (not cardstock) text paper in 12 x 12 size. Can you help? Yes, we have an assortment of 12 x 12 text weight sheets. On the right hand column, under Place Order, Select Type, click Text Paper. This will reveal just the text weight sheets. Currently, we only have metallic paper available in 12 x 12 text weight sheets. They are sold in 50 packs. If you would like smooth, matte finish sheets, we may be able to custom cut for you. Please call us so we can go over the possibilities. I make wedding favor boxes from cardstock and I’d love to work with CTI’s aspire petallics. I ordered a sample of 105 lb cardstock paper and it was much thicker than the cardstock that I normally buy. I think text paper will be way too thin though. Does this paper come in a weight somewhere in between the two? When you click through our Aspire Petallics colors, in the Specifications area you will see the Paper weight for the card stock displayed as either 98lb or 105lb cover. Currently Autumn Hay, Beargrass, Copper Ore, Gold Ore, Juniper Berry, Mountain Rose, and Silver Ore are 98lb cover. Black Ore, Snow Willow, Spearmint, and Wine Cup are 105lb cover. I assume you ordered a sample of one of the colors available in 105lb cover. The Aspire Petallics text weight sheets vary between 80lb and 81lb text, depending on color. Yes, there is quite a difference in thickness, weight, and rigidity between the text weight and card stock sheets. We do not carry a mid-weight grade in between our cover and text sheets. You may find the 98lb cover colors to be a bit easier to work with. You can order a sample of one of the 98lb cover colors to test. We would love to see one of your custom wedding favor boxes. Please consider our Share Your Creativity offer. Hi: I am looking for a fairly heavy cardstock – around 130-150lb – with a slightly reflective finish on one side for good photo reproduction. Any suggestions? Do you offer samples? Although we don’t carry photo paper, many people achieve great results with our own LCI Radiant White card stock. This card stock is available in 65lb, 80lb, 100lb, and 120lb, unfortunately, not in the heavier weight you’re looking for. 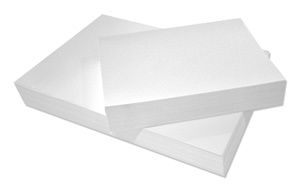 But just in case you could go a bit lighter, see our 120lb 8 1/2 x 11 Card Stock LCI Radiant White. Regarding samples, yes, we offer samples of almost all of our items. I am looking for a heavy weight business card. We currently have a sample of 130# but are looking for something even heavier. Do you have any suggests for paper? Can you tell me if that is 130# Index or 130# Card Stock / Cover Stock? I have cricut machine an I make different kinds of boxes. The card stock I use is to thin to hold up good. What weight of paper do I need? And I also make from the cricut Little houses. I would really appreciate the infomation. Thank tou Very much. Unfortunately we do not have much experience with Cricuts around here, but I can tell you that our favor boxes are made with 105lb card stock and hold up very nicely, and are nice and sturdy. Of course your box designs may be a bit different, but any stock over 90lb should work out well. What are the thickness of 60lb, 80lb, 100lb, and 110lb cardstock papers? At the USPS, the min. requirement for paper thickness for Every Door Direct Mail (EDDM) is 0.007″ (7PT). How can you convert from paper weigh to paper thickness? Unfortunately weight doesn’t always equate to the same thickness. Thickness varies with how the paper is made, if it is coated, how much it was compressed during manufacturing, etc. Some 80 lbs can be thicker or thinner than other 80 lbs as a result. Your best bet is to order samples of the papers you are interested in and bring them to your local post office. They can tell you with certainty if the thickness of the paper is appropriate. Hi there! Can you tell me which of your cardstocks heavy weight min 300gsm can be used to paint acrylics on without warping? Would they need to be primed? I plan to use them as journal pages with acrylics, block printing etc. thanks in advance! We have several sheets that may work for you that are 300gsm or thicker. We strongly suggest ordering samples, especially when we have not tested any of these papers with the medium you intend on using. If I am going to use a 80T metallic on top of card stock…sheet on the cover, and also an insert…what card stock should I use. It is for wedding programs. Thanks! If you are not printing on the card stock, you can use any weight you want for the cover. It all depends on how thick and heavy you want your programs to be.